Works perfectly with our Private Preserve. These All-Purpose Stoppers from Italy are the epitome of simplicity and utility. 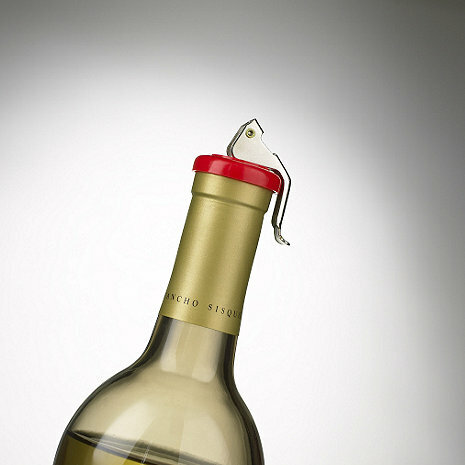 Just place one in an opened bottle of wine and flip the lever-- the rubber stopper expands to form an airtight seal. No kitchen is complete without a handful of these stoppers! Indispensable for picnics, too. will it work on soda bottles ? Are they one time use ? BEST ANSWER: Nope! You can use them over and over. I put them in the dish washer. Great product and works very well. I've had them about a year and a half and they have held up well. No, they are not. They fit most bottles fairly well. They're a good option for resealing an opened bottle. The Lever Bottle Stoppers (set of 6) are not a one time use only. They can be reused over and over again. I've been using mine for two years now! They are definitely not one time use. Enjoy! No, I have had several of these for many years. They work well. have been using these however when layer on side on shelf in the refrigerator, they sometimes pop off and spills wine all over the refrigerator any suggestions? BEST ANSWER: I would make sure the lever is all the way down as once this is done they should not come out. how long wine keep fresh? I have used them for a few years and have never had that problem. Are all six stoppers in the set red? How long is the stopper from the top of bottle (when inserted) to the tip of the leaver when the arm is in the down position? BEST ANSWER: Thank you for your inquiry. Once inserted, the top stopper is 2 inches. If you have any further questions, feel free to reach out to us directly at 800 356 8466. Thank you again. The top stopper on this bottle is 2 inches. Does this work for Champagne bottles to preserve the bubbles/carbonation? BEST ANSWER: This item will not work with Champagne bottles, they are specifically made for wine bottles. I would recommend Item # 499 31, Champagne Recorker. Preserve your champagne or sparkling wine for days. I bought these stoppers so that our opened wine bottle would fit back into the wine refrigerator. The original cork and many other bottle stoppers are too tall to fit in the fridge, or they don't seal well. These are low-profile and the seal is great! When you flip the lever rubber doesn't expand enough to seal the bottle. In fact it expands a little bit but not enough to seal. This stopper allows you lay the wine bottle on it's side without it leaking in the refrigerator. i'm using them for storing apple cider in glass water bottles. they work great and are cheap and they work! I bought one similar bottle stopper when I was vacationing years ago. I quickly regretted not buying more than one. After unsuccessfully looking for them in local stores, I was thrilled to find them again here. I use them all the time. Wish the metal was galvanized so it would not rust. This is a set of six stoppers in red, black and white. They seal very well. I use them with inert gas when I don't finish a bottle in one day. These are the best wine bottle stoppers I've ever used. I have so many that are attractive but always on the high side and do not go into the refrigerator standing up and could easily leak with the bottle laying down.I also have no concern about taking wine on a picnic since the stoppers hold so tightly when used that there is no way there would be spillage if the bottle were laying down or knocked over. When friends see the stoppers they want them too. I keep an estra stopper in the bottom of my travel wine bag so when I go out with an unopened wine bottle, I can make sure it won't leak if there is any left on the way home. I purchased this product because I own one of a similar design, and was delighted to find a source to purchase more. Sadly, the quality of this one is nothing like the first I purchased. It is not as well finished, but worse, it pops off the champagne as it sits in the fridge. Tried to seal the bottle. stopper would easlily pull out of the bottle. Not tight enough. Functional, at a good price. I would buy them again. Thanks for carrying this product. I knew it already because a friend has some. She needed more, and I wanted some too, so the purchase was a 'twofer"
I really like this wine topper. These are easy to use..they keep wine sealed for months! We use them everyday and have given several sets as presents!! My other stoppers were popping off in the cooler and spilling wine. These stoppers create a perfect seal and keep the wine fresh with the preserver spray. Easy and quick to use!! Better than pushing the old cork back in. Came within a few days. Easy to use. We like the wine stoppers. They work great and keep the wine fresh. Use this all the time in our home bar, and also during the summer months. Give this with a bottle of wine when going over friends homes. I purchased this product because it does not leak when wine bottle is laid in it's side. Works great. I would recommend! Great for home bar keeping. I've only had the bottle stoppers a little over a month, and I haven't had a problem with them. I haven't had a problem with any of the bottles I've used them on. When closing them on a bottle, it takes some effort, but it provides a good seal. It is too early to tell how long they will last, but they appear to be durable. It's pretty efficient and easy to use. They are a little difficult to push down. Once you get used to it though it becomes a little easier. It would be helfpul if there was a latch on the other side of it so you have something to hold onto when trying to secure the top. They work really well and don't add much space up top so they are perfect for a wine refrigerator cooler. the wine stoppers are nice and pretty easy to use. only thing is they don't fit larger bottles of wine. just the standard size. For that glass of wine in the evening--, just as fresh many days to come. Just bend the lever and presto! Your wine is not going to leak out in the fridge! A little clumsy to get on but do stay air tight. They are listed as Italian made is that true? Very easy to use,clean and store. A handy tool for keeping your wine stored--and not having to use the cork for resealing. showed up quickly ... excellent. My husband & I go to the lake alot and ride around in a boat. Our drinks we prefer are beer & wine. Throw the wine with the stopper in it and I never worry about LEAKAGE!!!!!! Its GREAT!!!!! These Lever Bottle Stoppers are exactly what I expected and needed. I recommend them. Be careful not to cut yourself when you push down the lever. I bought this product b/c the wine refrigerator that I bought from Wine Enthusiast does not fit bottles with a wine stopper in it. It makes the bottles way too long, and you cannot close the door. So, I needed a stopper that is very short. Don't waste your money. When I received these, I had large and small wine bottles and I tried to put the stoppers in both of them,and they were no where close to fitting in the bottles. Even after pulling the lever down, the stopper did not expand anywhere close to the inside rim of the bottle. There is no use for this product. It is too loose for every bottle we tried it on. a great wine stopper for the price. not as attractive as some higher priced, but very functional. This stopper is just what we needed so that bottles will fit into the door of our fridge. Most stoppers add too much to the height. The tight seal also makes it possible to place the bottle on its side. I didn't give it 5 stars because as other reviewers have noted, this doesn't work in larger bottles because it doesn't expand enough. It also doesn't work on bottles with a twist cap - we tried this when we lost a cap, but once again, the stopper doesn't expand enough. Other than this, it works well for most standard wine bottles and is a real find.